First event deemed a smashing success - reunion tour unfurls. Atomic Crash Party #2 slated to crash Paul & Carrie's sweet Mid Century Modern abode nestled calmly in Noblesville, IN. We'll descend to add a little swanky yet respectful ruckus to their otherwise quiet cul-de-sac. Big shout-out to Carrie. You're tops! Paul and Carrie were diligent house hunters. They insisted upon finding Mid Century Modern nirvana. Nothing less would do. They succeeded. In Noblesville of all places. Only took them four years. They found an original-owner home in near mint condition. Since then they've changed virtually nothing. Paul tells us this is a blessing, and a curse. Ask him about it. Atomic Crash Party #1 benefited from original architect, J. Parke Randall attending. Graciously. Not to be outdone, Paul and Carrie rounded-up Mr. Jack Pecsok who designed their home while he was still in school - at age 21. This was Pecsok's first built residential design. How cool. Mr. Pecsok can't wait to meet you. Fear we may be setting unrealistic expectations with all these "original architect in attendance" announcements. A risk worth taking. Small world; J. Parke Randall and Jack Pecsok were former partners. ACP#2 may witness a reunion of Mid Century Modern proportions. Even the blue door is original. 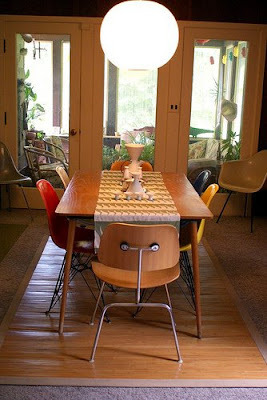 Entire abode is basically an Eames chair museum. Conversation pit with double-sided fireplace to adjacent dining room. 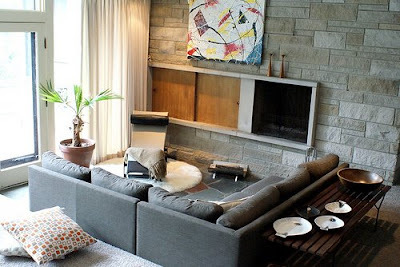 Paul has been an avid collector of Mid Century Modern furniture for nearly 12 years. Carrie is a former mod furniture showroom manager. This combination entwines to leave you shudder-shook in awe. Furniture collection alone is worth the trip. Just saying. Location: Noblesville, IN (35 min. N. of downtown Indianapolis). RSVP for address. Address shared 3 days prior to event. If not on Facebook, please RSVP via email with a subject line of, "Atomic Crash Party #2" Let us know how many you’re bringing. P.S. If you're out-of-state and would like to start an Atomic Crash Party series in your hood, shoot us an email. Happy to help your effort with our learnings, artwork and promotional reach. Ooh... I wish I were in Indiana. Just a gorgeous modern house. Love the conversation pit / fireplace! Umm... wondering if anyone else is having this problem. I am posting as 'anonymous' because I keep on getting an incorrect password message. I even signed up for a new Google Account, because it wouldn't take the first one either. So, this is a username and password I just signed up for. I've passed on a Blog Award to you by naming you in my latest post. Thanks for all the inspiration!